Pdf page organizer (a-pdf page master) is a simple and lightning-fast desktop tool that lets you modify and organize your pdf document pages. Pdf page organizer enables you to manage multiple pdf documents in a comprehensive and smart way. You do not need adobe acrobat software to be previously installed. Why pdf page organizer simple interface simple to use save time save money with the help of pdf page organizer, you are able to manage pdf pages easily in minutes. For example, you can insert, delete, clone, extract, replace, rotate, reorder, move, rearrange and resize pdf pages. Moreover, you can extract pages as a new file and merge pages from another pdf file. Also, there is a flexible pages selection. Pdf page organizer allows you to do the following things freely and easily: page editing: including cutting/pasting, cloning, deleting, inserting blank pages, rotating, resize, batch deleting, inserting blank pages and rotating pdf page. Page arranging: including changing page order, reversing, assembling, etc. Page merging and extracting: including combining pdf page, extracting pdf page etc. As pdf files have become a kind of document that is widely spread in all kind of environments, from the publication manuals, to the presentation of university projects, it is necessary for us to apply some useful tool to manage our pdf files and master our pdf document pages. 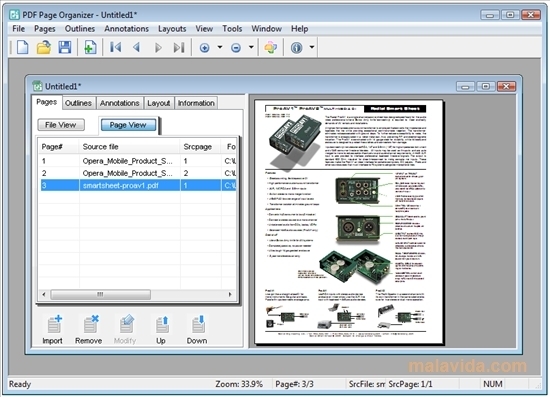 PDF Page Organizer is an utility that works under windows xp, . Estimated download time for PDF Page Organizer on a common adsl connection is less than a minute. Version 2.9.0 was released one thousand seven hundred seventeen days ago by A-PDF.com. Click the green download button to download it now.